“In Mongolia, when a dog dies, he is buried high in the hills so people cannot walk on his grave. The dog’s master whispers into the dog’s ear his wishes that the dog will return as a man in his next life. Then his tail is cut off and put beneath his head, and a piece of meat or fat is placed in his mouth to sustain his soul on its journey; before he is reincarnated, the dog’s soul is freed to travel the land, to run across the high desert plains for as long as it would like. 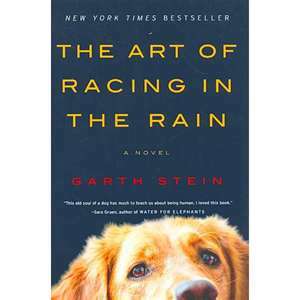 The Art of Racing in the Rain, is a novel written by Garth Stein, an American author and film producer. The story is told by a lovable mutt, Enzo, who dreams of dying and returning back to earth in human form. He sees himself as different from other dogs because he loves to chase cars. He learns by watching TV with his best friend, Denny, who is an up and coming race car driver. As he awaits his death, he looks back at what his family have been through the past years –the sacrifices that Denny has to make for his career, the eventual loss of Denny’s wife, Eve, due to cancer, and Denny’s three year battle with Eve’s parents over the custody of his child, Zoe. This is such a heart wrenchingly funny story of family, love, loyalty and hope. I had a hard time putting down this book once I started reading it. I laugh a little and cried a lot as I was getting deeper into the story. The extraordinary friendship between Enzo and Denny is amazing. I can’t help but think about my dog Bruns and recalling the times when he was Enzo-like to me. 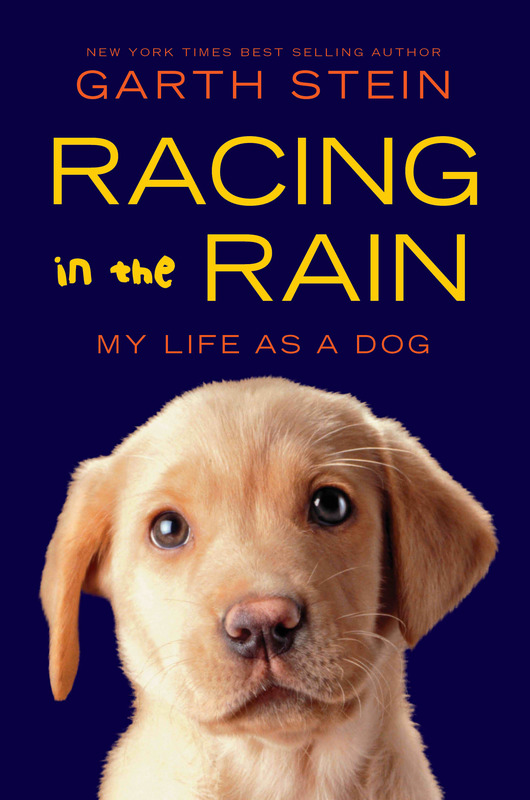 :) I was impressed with the way Garth Stein seamlessly incorporated his vast knowledge of the dog’s psyche (how they respond to human and how they perceive things) in the story. If you don’t like or love dogs, after reading this, you definitely would want one. I was thinking at the onset that this will probably be one of those novels with a predictable ending. But the unexpected twist towards the last few chapters got me hooked till the end. Surprisingly, I did not feel any heaviness in the heart even after crying so many times while reading this. It did not leave me bothered and affected for days, the way Nicholas Sparks’ books often do. In the end, you would want nothing but to celebrate with the characters because their story ended very well. There’s that renewed sense of hope and celebration of life towards the end. It is also refreshing to note how Garth Stein presented in the book the man’s perspective in situations where woman will openly respond to with drama. It gave me an insight on how a man’s mind works in certain situations. The title of the book is as such because Enzo learned, through Denny’ experiences in racing, that life is simply not about going fast. He learned that to successfully navigate through life’s learning curves, you have to use the techniques needed in the race track. If you are a guy who is into racing, you will find this book interesting because of those tidbits of racing facts and infos that form part of the story. If you are a girl who’s looking for a nice and easy yet meaningful read, this one is for you also. This post reminds me na I haven’t read books for months now. Buti ka pa, may time to read novels 🙂 Anyway, I also find the title interesting. And the cover is effective kasi ang cute ng dog..
i just missed reading a good book..
Now, you have convinced me to read it. Such a well constructed book review. You write very well. Congrats. This weekend my friend and I have been talking about Wagyu beef, I like that pic with a deer walking freely there, Every dish came nice with a wine Perfect! the beef looks scrumptious though. Best in the world! It lived up to its expectation. Clash of Clans Hack website is for you. la franchise Need for Speed avec des voitures exotiques et de la police poursuites à haute vitesse. chaque côté de la loi offrant son propre ensemble de défis, les risques et les récompenses. l’hôte de déchets entre police et aux voleurs. Very gooԁ post. I ԁefinitely appreciate this website. this ωeb page and be uup to date all thhe time. Thanks for sharing your thoughts about Enzo the lovable mutt. if thaat would be ok. Ι’m undoubtedly enjoying your blog and loolk forward to new posts. Somebopdy necessarily lend a hand to make significantly posts I wwould state. page and so far? I amazed with the research you made tto create thiis particular publish extraordinary. Downloading Dice world typically fees cash. I will provide you Dice World entire edition which you can down load below for totally free. World with the website link supplied right here. created/produced by Wollay and his spouse. Dice Planet was commenced in June 2011 and now, the Alpha variation is out previously. Very pleasant hobby, good fun. Great article!! thanks for sharing racing in the rain. Recently i am reading this article and i love this website. Wow!! that is interesting post i am reading and enjoyed your post thanks and keep sharing. Thanks for sharing such an article with so much pain in the story. I like the concept and surprised by the way Mongolians people loved there dogs. hello, sir i have gone through to all your posts. They all are good, and they all are useful for us. I check your site regularly. We hope that you will provide better and more stuff with us in future. Thank you. wow what a nice post brilliant. Really good work.tahnk you very mush. wow thanks for this post! blog, you have lots of great content. I look forward to reading more posts from you. splendid troubles here. i’m very happy to look your article. thanks so much and that i’m taking a look forward to contact you. Great post. I really love to known more about dogs.